In West Michigan lies Peach Ridge, aka The Ridge, an area eight miles wide and 20 miles long so named for its ample fruit production — peaches before the big freeze, apples today. It is blessed with a unique climate formed by its 800-foot elevation and proximity to Lake Michigan, and rich, clay loam soils with excellent water-holding capability. Its residents are as fiercely loyal to it as if it were its own country. And if The Ridge had a king and queen, few would quibble with the coronation of fourth- and fifth-generation apple growers, respectively, Judy and Phil Schwallier. 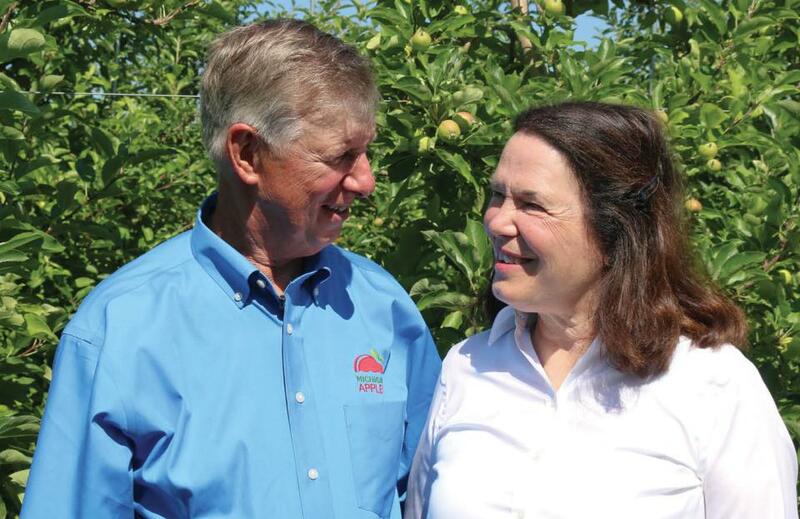 In part because of those qualities, American Fruit Grower® and Western Fruit Grower® magazines are pleased to announce Phil and Judy Schwallier of Sparta, MI, are our 2018 Apple Growers of the Year. The Schwalliers will be formally presented with the award, which is sponsored by Valent USA, at the annual U.S. Apple Association Apple Crop Outlook & Marketing Conference in Chicago, Aug. 23-24. Phil and Judy follow in the footsteps of such early award winners as Grady Auvil and John Rice, as well as recent recipients Scott McDougall and Rod Farrow. The award has gone to husband and wife teams in the past, including Bill and Jeannette Evans in 2014 and fellow Michiganders Harold and JoAnn Thome in 1992. Harold Thome is still active, and he was on the International Fruit Tree Association’s 2017 Summer Tour when Phil and Judy got the opportunity to show off their beloved Ridge, of course not for the first time. Phil served as IFTA President in 2013-14 and encourages tours of The Ridge, which makes sense as IFTA, then IDFTA, was founded in nearby Hartford in 1958. The Schwalliers met on April 2, 1976, Judy’s 19th birthday. She had gone to see Phil’s band, Petal Fall, and they struck up a conversation during the first break. Back on stage, Phil announced it was her birthday, and just for fun said she was giving out free birthday kisses. But, he told the fellas, be careful. On his way to picking her up on their first date, Phil was involved in a car accident driving to her house. But he was not hurt, and they were married two years later. They purchased their first farm in 1979, where they still live. Ten years later, they started their farm market, Schwallier’s Country Basket, which has enjoyed great success in its nearly 30 years. It began as nothing more than a picnic table under a tree by the side of the road. Today, not only do they surpass 200,000 visitors a year, the market is featured on the Grand Rapids Chamber of Commerce list of 100 things to do in the region. On busy days, the line of people waiting expectantly for Judy’s delectable donuts wraps all the way around the bright red barn. But Judy and Phil keep it real. “When I come home, we talk about the things that need to be done. Usually, Judy says I tell her what needs to be done. But I think it’s she who tells me what needs to be done. And I agree,” Phil says with a smile. The market is a real family affair, as Phil and Judy have had four children through the years, and all have worked in the market. Today it’s the five grandchildren’s turn. Even Judy and Phil’s respective fathers worked at the market — when both were in their 90s. Judy’s dad, Carl May, is 93. Phil’s dad, Fred, died in May at the age of 95. From the time Phil was driving a tractor at the age of five, he spent a lot of time by his father’s side, learning how to be a grower and so much more. Phil got both his bachelor’s and master’s degrees at Michigan State University (MSU). Interestingly, he was the first graduate student under another well-known university researcher, Jay Brunner, who recently retired from Washington State University (WSU). He was also the last one. Meanwhile, Phil was working for MSU Extension District Agent Frank Klackle, supervising IPM advisors for him. He participated in a lot of grower meetings, and that’s when and where he got the idea to pursue a job in Extension. In Grand Rapids, they created a position for Phil, County Horticultural Agent, and he began what is now nearly four decades of working with growers. Amy Irish-Brown, the MSU Extension educator who works closely with Phil, says it makes sense. One of those young growers is Kyle Rasch, who shared what makes Phil so valuable. Phil, perhaps predictably, says the growers make his job easier. Perhaps because of that, grower Don Rasch believes Phil is building something that’s going to last a long time. That talent was tested severely around the turn of the millennium. The U.S. apple industry hit hard times in the late 1990s, but it was even worse in those apple-growing states like New York and Michigan where the thrust of the apple industry was not necessarily fresh consumption. The apple juice market many of the Northeast and Midwest growers pursued was drying up. China began offering apple juice concentrate at a price that was almost less than what it cost a Michigan grower to harvest his fruit. It became impossible to compete. For example, in Michigan there were 60,000 acres prior to 2000, says Phil. By 2004, the economic slump had caused the loss of one-third of that acreage. The orchards were razed, or even worse, abandoned. It wasn’t quite so bad on The Ridge, where growers could adjust better. Pursuing higher prices, they had been planting more apples for the fresh market and fewer processing varieties. That also meant they had younger orchards planted in the new — for the time — high-density configurations. Apple grower R.J. Simons of BelleHarvest recalls those dark days vividly. Phil, who has the almost impossible optimism that infects all fruit growers, seems to have inherited more than his share, he says. Simons is the current President of the Michigan Pomesters, a nonprofit on The Ridge that aspires to bring together and educate people from all levels in the tree fruit industry. But even such a positive bunch was rocked by the economic hardship. Of course, Phil had a secret weapon that really was secret in those days: ‘Honeycrisp.’ Because of his position with Extension, Phil says he was one of the first growers to plant ‘Honeycrisp’ — back in 1995. When he began harvesting a few years later, Phil took full advantage, as Judy had given the variety her full endorsement. “Most people just love that crunch,” she says. They started giving one free ‘Honeycrisp’ to everyone who came to the farm market. Whether tourists from Chicago or Lansing, or a school group, everybody got a ‘Honeycrisp.’ It was an immediate hit. Today they have about 100 acres of apples, with 98% of the apples sold wholesale and 2% sold on site. They have the old traditional varieties like ‘Cortland’ and ‘Jonagold’ people come to pick every year, along with newer varieties such as ‘Evercrisp’ and ‘SweeTango.’ They continue to try and add new things every year and now have pick-your-own raspberries and a pumpkin patch. The Schwalliers’ orchards look like any others, except for all the signs and other marks indicating university trials are going on. Those little flags fluttering on the trees in his orchards aren’t just for good looks. He’s always working on any number of research projects. The Michigan Apple Committee alone has funded 39 of Phil’s research projects to the tune of $441,337, says Executive Director Diane Smith. Though when Smith thinks of the Schwalliers, she thinks about a lot more than research. Phil’s been testing plant growth regulators for decades and is acknowledged as the expert in the Midwest on thinning apples and achieving maximum crop loads of higher priced, target fruit. About 20 years ago he started doing trials on his own farm, testing products and ideas. About four years ago, he got to wondering how many different trials he had conducted in their orchards, and counted 78. Congratulations Phil and Judy. No one more deserving of this award than you! Well deserved honor ! Judy and Phil are true professionals. 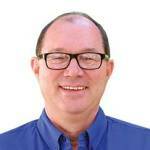 Phil has been a tremendous resource to our company and we don’t thank him nearly enough. Congratulations to Phil and Judy. Congratulations Phil & Judy… well deserved!